The Southern Super Series presented by Sunoco's first trip of the 2014 season to Montgomery Motor Speedway in Alabama will be a homecoming of sorts for Shorter, Alabama’s Hunter Robbins. The Auburn University Mechanical Engineering student, who will graduate following the summer semester, is a former Pro Late Model Show Me the Money series champion at Montgomery and considers the half-mile his home track. Having opened in 1953, Montgomery Motor Speedway is the oldest operational track in the state of Alabama. Although 22-year-old Robbins wasn’t around in those days, he is hoping to add his name to the record books in 2014. Robbins scored a win in the Pro Late Model Show Me the Money season opener in April and now hopes to translate it into success in the Southern Super Series’ first trip to MMS on May 10. In the Southern Super Series inaugural season in 2013, Robbins posted three top-10 finishes at his home track with two eighth-place finishes and one seventh. In 2014, Robbins is ready to improve on those stats by putting a few more marks in the win column with his Ronnie Sanders Racing Super Late Model program. Robbins will have an unconventional type of home track advantage on Mother’s Day weekend as well. The Saturday, May 10 Southern Super Series Rumble by the River 125 will run on Saturday night before the Sunday holiday and Robbins will be running in his own back yard. The Southern Super Series Rumble by the River 125 at Montgomery Motor Speedway will take the track on Saturday, May 10. For more information on the Southern Super Series, visit SouthernSuperSeries.com. The Facebook page for the Southern Super Series is located at www.facebook.com/southernsuperseries. The series is also on Twitter at @SoSuperSeries. For advertising or sponsorship questions, please contact the track representatives. For media inquiries, please contact Matt Kentfield at 51 Sports via matt@51sports.net. 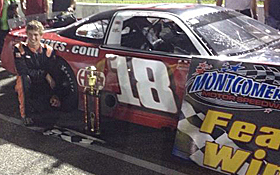 Hunter Robbins won a PLM race at Montgomery already this year. Now Robbins hopes to win in the SSS Super Late Model event on May 10th.